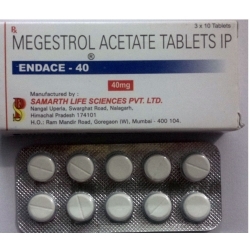 Endace (megestrol acetate) by Samarth Life Sciences is generic version of Megace a man-made substance called a progestogen which is similar to the female hormone progesterone. Hormones are substances that are produced naturally in the body. They act as chemical messengers and help to control the activity of cells and organs. Endace (megestrol acetate) is known as a hormonal therapy. Although it is mainly used to treat breast cancer Endace (megestrol acetate) is sometimes used to treat cancer of the womb and occasionally to treat prostate cancer. What is in Endace tablets? Endace belongs to group of medicines called "progestogens" and is related to the naturally occurring hormone called progesterone. 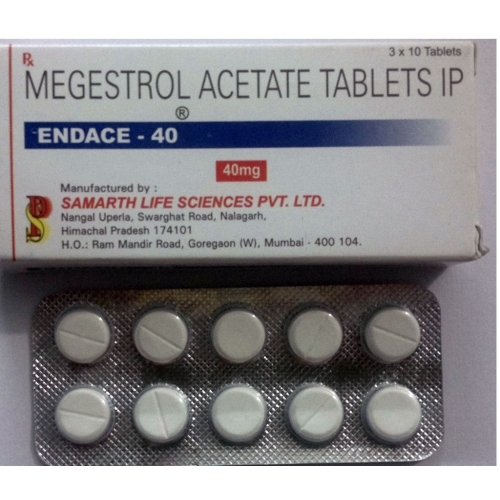 The Active ingredient in Endace is called megestrol acetate (Megace). Endace tablets are available in 40 mg .
Endace 40 mg tablets contain 40 mg megestrol acetate, acacia, and calcium hydrogen Phosphate; lactose; magnesium stearate; maize starch; silicon dioxide. These are available in packs of 10 tablets. How do they work? Some tumours such as breast cancer are stimulated by the bodies own female hormone (Oestrogen). Stopping the bodies hormones reaching the tumour can cause the cancer cells to stop growing and in some cases shrivel up and die completely (self destruct - apoptosis). Endace works in two main ways. Firstly it fools the signal pathway between the brain (pituitary) and the Ovaries by increasing the blood levels of another hormone produced in the ovaries called progesterone so in turn the brain thinks the ovaries are producing too many hormones including oestrogen. As a consequence the body switches off the driving signal from the brain by itself - this results in reducing the blood level of oestrogen. Secondly Endace has a direct effect on the tumour via its own receptors called progesterone receptors. Stimulation of these receptors causes the cell to slow its uncontrolled growth and become less aggressive. How will I & the doctor know they are working? In most cases there is something the doctor can measure. This may be how you feel, a symptom related to you cancer, something which can be felt on examination (e.g. a lump) are something seen on a scan or xray. After 2-3 months a formal assessment of response is usually performed before continuing the tablets indefinitely - This may well involve repeating the xrays or scans. Possible side effects. All tablets have side effects. These can effect some people more than others. It its hard to predict the level and type of side effect for each individual. Listed below are an overview of the more common side effects you may encounter, however, you may experience none, all, or only a few of these. You may also have a rare side effect not listed here - If you become aware of any other side effects, please report them to your clinic. If side effects are severe, you may have to stop tasking the drug and a different hormonal drug may be prescribed. Side effects are more common in pre-menopausal women who may develop menopausal side effects as a result of a reduced level of oestrogen. The commonest side effects, apart from nausea, are hot flushes and sweats, particularly at night. Nausea and indigestion. Feelings of sickness (nausea) and indigestion are fairly common but can often be relieved by taking your tablet(s) with foods or milk or at night. Although mild nausea is quite common initially it usually wears off after a few weeks. Weight gain. Weight gain can be a side effect of megace and this is sometimes due to water retention but at other times a consequence of a eating more either due to a increased appetite or mild nausea - "to settle the stomach". Ankle swelling. If women are prone to ankle swelling this may be worse, it is caused by fluid retention. If one leg gets swollen tender and hot this may be a thrombosis and should be reported to your doctor immediately. Change in periods. Women who have not yet reached the menopause may notice their monthly periods change – they may become irregular, lighter or sometimes stop altogether. Some women also notice an increase in vaginal discharge and vulval itching. Less common side effects include depression, tiredness, and dizziness. If you have a history of blood clots (thrombophlebitis). Other issues. There is no interaction between Megace tablets and moderate amounts of alcohol.Megace tablets do not usually affect your ability to drive. Megace tablets may raise your blood sugar if you are diabetic. If you notice that your blood sugar is higher than normal consult your doctor.